Here’s an interesting battle as you head into the weekend. Not the Alfa-AMG battle featured above from Top Gear, which is certainly interesting in its own right. We’re talking about the battle of names, because these two SUVs contain more letters than a bowl of alphabet soup. Alfa Romeo Stelvio Quadrifoglio is 28 characters by itself, and though it’s shorter, Mercedes-Benz GLC 63 AMG is still a mouthful and then some. Perhaps the real race here is whether you can say the names of these high-performance SUVs before they actually reach the finish line. Thankfully, we have abbreviations for such things, so we can simply enjoy the straight-line matchup between the AMG GLC 63 and the Stelvio QV. On paper the two people movers are virtually identical, with the Alfa’s 505-horsepower (377-kilowatt) twin-turbo V6 barely edging out the GLC 63’s 503-hp (375-kW) twin-turbo V8. Both turn all four wheels, both weigh nearly the same, and lest we forget, both are Nürburgring record holders. That is, the Alfa was a record holder, until the AMG took its title as the fastest SUV last November by just under two seconds. As such, there’s some serious competition between these two models. 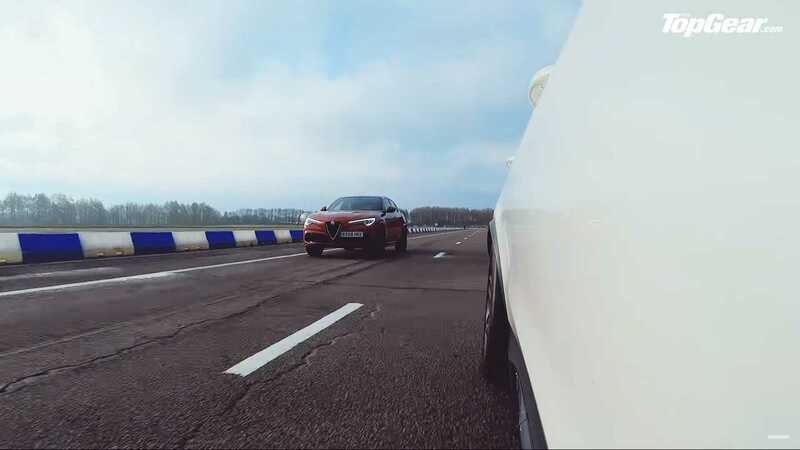 The drag race is a simple sprint with Top Gear presenter Rory Reid holding station in the Alfa. We don’t know the length of the run, but we do know one thing – the only real difference between these two SUVs is torque, and the AMG’s bigger 4.0-liter engine holds a distinct advantage. We see that at the start as the Merc pulls away ever-so-slightly, but can it hold the lead through the finish line? Most drag races are won or lost at the start, but the Alfa is quite a machine. We’ll let the video do the talking for the final outcome on this one.